A Great Way To Buy Cheap Callaway Golf Balls! If you and a group of mates want to get togther and buy a bulk load of Callaway golf balls we have the stock for you. This will be a random mix of all Callaway ball types except The HX and Tour Series. Models include Warbird, Big Bertha, Big Bertha Diablo, CXR, Warbird Plus, HX Diablo and HX Diablo Tour. These balls are all in good condition and have plenty of play in them. Many of these balls just missed out on our AAAA/Near Mint grade and have scuffs and blemishes to show that, the other balls sit slightly below this level and have plenty of mileage left in them. The balls do have wear marks, some with no shiny surfaces but nothing to stop you playing a round with them. If you want to play a great brand and don't mind slight scratches and wear then these are the balls for you. These are the most expensive golf ball in the game and you can expect to pay $2 per ball for this quality in the pro shop! Product delivered as promised, and in a timely manner. I will be back. Balls delivered in reasonable time and quality as promised. Very happy and will be back. Great service, quick response to email and they followed up with a phone call. Package delivered within 3 business days to central Queensland - though as there was a day delay he threw in an extra 20 golf balls on a 200 ball order. Overall really happy with the product. Great company to deal with and a great product. Highly recommend this company, service was good as usual. Excellent service and great quality balls. Extremely fast postage, thanks Lost Golf Balls. A Great Way To Buy Cheap Callaway Golf Balls! 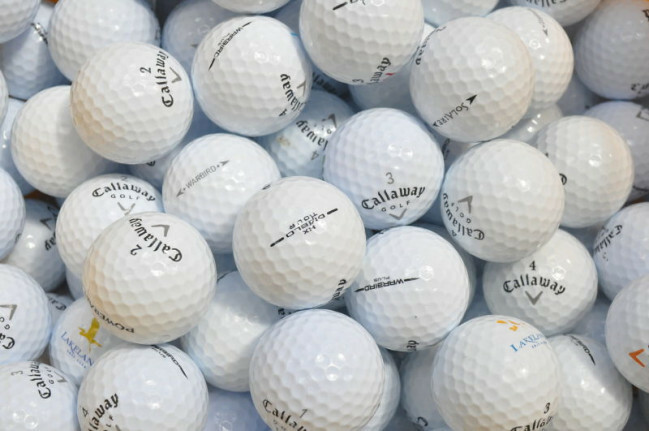 If you and a group of mates want to get togther and buy a bulk load of Callaway golf balls we have the stock for you. This will be a random mix of all Callaway ball types except The HX and Tour Series. Models include Warbird, Big Bertha, Big Bertha Diablo, CXR, Warbird Plus, HX Diablo and HX Diablo Tour. These balls are all in good condition and have plenty of play in them. Many of these balls just missed out on our AAAA/Near Mint grade and have scuffs and blemishes to show that, the other balls sit slightly below this level and have plenty of mileage left in them. The balls do have wear marks, some with no shiny surfaces but nothing to stop you playing a round with them. If you want to play a great brand and don't mind slight scratches and wear then these are the balls for you. These are the most expensive golf ball in the game and you can expect to pay $2 per ball for this quality in the pro shop!